I was not a tourist. 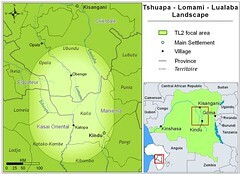 I had two weeks to visit our new southern base camp from which we are exploring the entire 23,000 sq miles of forest that make up the three-river basin, Tshuapa-Lomami-Lualaba (TL2). Importantly, I needed to make “diplomatic” contacts with local authorities. John came out from the camp to meet me in Kindu. He let me know that the trip, although less than 150 miles, would be a trial by water. John, wet to the thighs, pushes along the main road. “Prepare yourself,” he said. “There are 99 bridges to negotiate and none of them are easy.” That seemed extreme. So I tried to count them along the way. 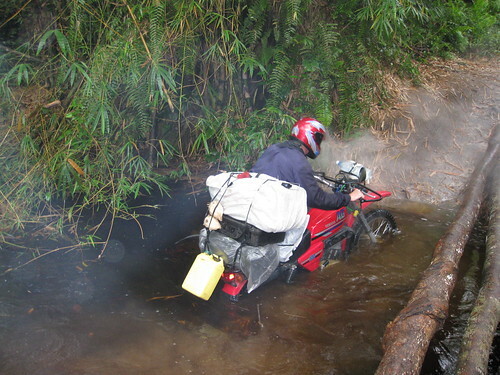 Indeed our motorbikes had to cross water more than 80 times, but I lost track both going and coming. 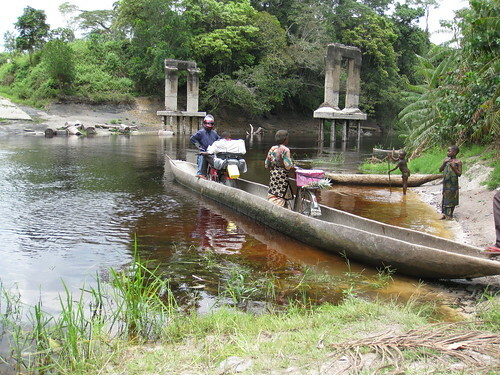 Two were dug-out ferries (across the Kasuku River and the Lomami River). Loading our motorbikes to cross the Kasuku river. The ghostly struts of a bridge from “colonial glory” stand waiting for some still indiscernible change in fortune. 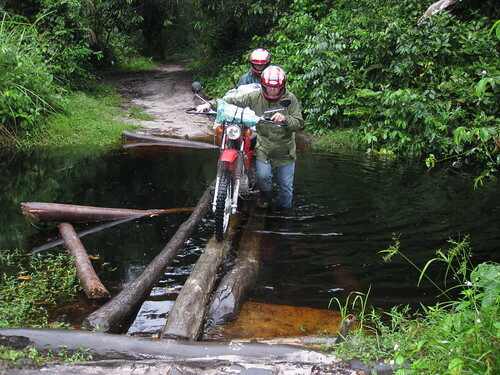 Eight (still close to Kindu) were “legitimate” bridges that we could cross without dismounting our motorbikes. The rest were each and every one a project. First: get off the moto . Second : at least two people (preferably bigger and stronger than me) position the bike on the narrow uneven logs. 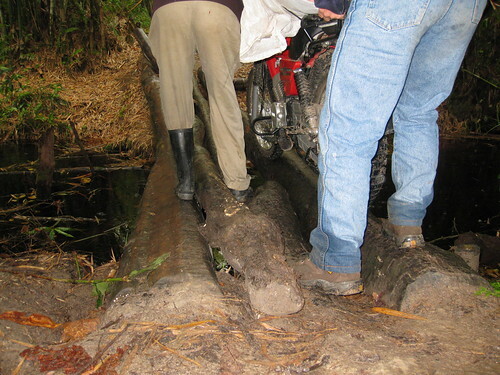 Positioning the bike on the uneven logs. Third : balance, counter balance, re-position and heave. Some of the streams we tried to ford, few of them successfully. Too often we stalled before reaching the other bank. We made it in two days, arriving at Katopa camp at 19hr 30 (7:30 PM, well after dark) on the second day. The distance : 230 km or 143 miles. Of course we did not meet a single tourist and it has probably been at least 30 years since anyone even remotely considered this magical place as a possible tourist destination. 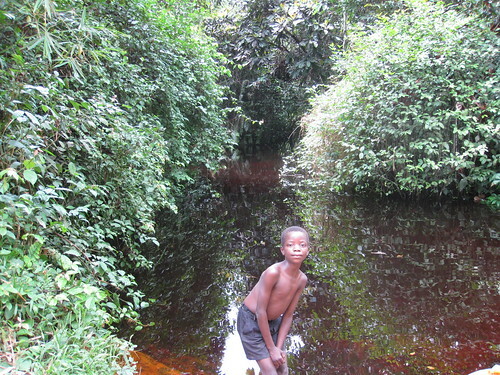 Not sure whether to pose or flee, at a truly magical stream crossing. We will continue to build a little collection of notes for the intrepid Congo Tourist. This entry was written by Terese Hart, posted on 2008-11-05 at 12:00 pm, filed under About the project, Kindu. Bookmark the permalink. Follow any comments here with the RSS feed for this post. Post a comment or leave a trackback: Trackback URL. That last photo is truly magical. I love how the background melts with the foliage. Please continue posting these accounts and photos, they are immensely exciting. The more detail the better! Wow, such an adventure! Reminds me of our trip from Kisangani to Aketi! Those roads are terrible, and the bridges are terrifying! I’m glad that you made it in one piece! C’est cool . dans mon agence je propose ces genres des voyages. dans la province de Bandundu et Equateur en RD Congo. c’est une bonne experiance.